Lovely plump peaches and orange peel, with a refreshing dry finish. Perfect on its own, but I reckon it would be good with thai/green curry prawns. 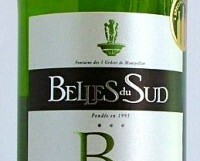 I like both Marsanne and Roussanne, but there are some truly awful cheap versions from the Languedoc. This is an exception; It won’t ever compete with the great wines of the Rhône valley, but at €8 it is a real bargain.